These stories might be childish, but adults will like them too, for the reach and contemporary feel of their messages. 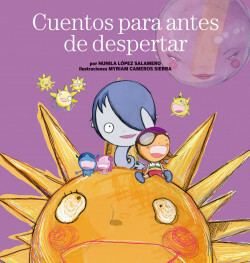 Cuentos para antes de despertar addresses the latest social movements and revolts, the struggle against homophobia, social exclusion, domestic violence and women’s rights. Myriam and Nunila, rebuilders of broken dreams, hereby present a new collection of stories to move us and make us think; inspirational, tender tales which celebrate authenticity and solidarity, show us how important it is to love ourselves and always, always, leave us with sparkling eyes and a smile on our lips. The authors of The Cinderella Who Didn’t Want to Live Happily Ever After, return with a volume of stories with a stunningly contemporary message.